Awareness - Content focused on educating your audience. Evaluation - Customers determine whether they need your product. Conversion - Reasons to buy your product. Delight - Keeping your audience engaged. Like it or not, a lot of the content we consume online has a very specific purpose: to get you to buy. Or sign up. Or learn more. Even the seemingly fluffy pieces like “The 10 Best Dog-Friendly Hotels in Seattle” have been crafted to influence a specific response. Why? Because most of the content we read and interact with on a daily basis is part of the content marketing funnel. Learn more about this content funnel and different types of content marketing. 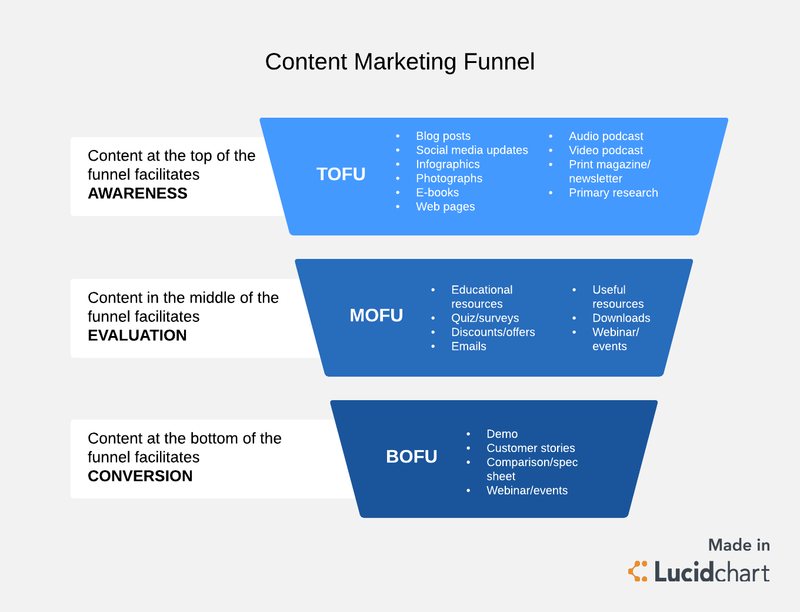 What is the content marketing funnel? The content marketing funnel visualizes the journey that potential customers go through when considering a purchase, and it’s part of a larger overall content marketing strategy. The content in the different stages supports the customer journey, and good content pushes your leads closer to a purchase. The four stages of the content marketing funnel are awareness, evaluation, purchase, and delight. Each stage serves a specific purpose in the customer's journey, as should the content presented to the customer in those stages. What type of content do I need to create? How will I measure the success of my content? Where can I improve my content strategy? 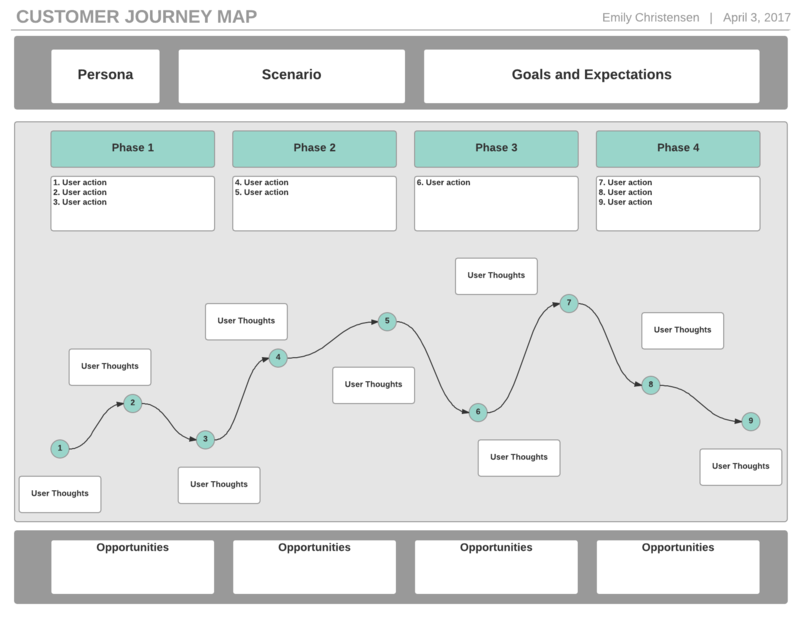 To understand how your content fits into the overall customer journey from discovery to purchase, you may want to build a customer journey map. Are prospects viewing, interacting with, and sharing the content? Is my target audience interacting with my content? Is there any follow-through after interaction? Use metrics like time on page, number of reviews, and bounce rate to assist in answering these questions, and dig into Google Analytics to understand more. If you find that your content falls short or doesn’t address the correct audience, pivot. Just because you’ve started on one path doesn’t mean you can’t make changes to your strategy. In the middle of the funnel (MOFU), potential customers determine whether they need your product or service. You’re also attempting to build trust with your consumer in the evaluation stage. No one buys from or does business with a company they don’t trust, so look for ways to build that relationship. Are people converting from this content? Am I generating new sales or leads from this content? Is this content helping or hurting my end goal? Good content creation helps incrementally move a prospect toward a purchase. It doesn’t happen all at once, so don’t expect one piece to do all the heavy lifting. That’s why it’s so important to vary the types of content marketing you use and to have a comprehensive content strategy in place. Everyone wants to feel confident in a purchase. Give your potential customers very clear reasons why buying your product or investing in your service is the smart thing to do. The content funnel up to this point has been about getting customers interested in your product. Now, at the bottom of the content marketing funnel (BOFU), give them a reason to buy. By offering side-by-side comparisons of similar products—and highlighting how your product or service is superior—you can easily influence a purchase. Does my content have a clear call to action? Am I making the purchase process as simple as possible? Offering a free trial of your service can also lead to a purchase, as long as you aren’t giving away the whole product. An introductory trial gives potential consumers a taste of what you do but should leave them wanting more, since your objective is to convert them to a sale. Although it’s not part of the traditional content marketing funnel, many companies have added an additional step to retain or delight customers. Your overall content strategy should be aimed at building an audience and keeping them engaged. That work extends beyond the purchase stage. Does this content encourage customers to leave feedback? Does the content give readers reasons to refer their friends? Does this content showcase real customer successes? Reward your audience with special promotions or early previews of new products. Even if your customer isn’t a repeat buyer, they still have influencing power in their social circles. Creating content that converts is the number-one objective of the content marketing funnel. With a solid strategy in place, your business will be able to engage with and influence customers at every stage of the content marketing funnel. But a strong content strategy is just part of the overall equation. It’s also important to understand how your content pieces are performing using defined metrics. Regularly check in on your existing pieces of content and look for ways to improve or repurpose. And don’t forget to give new and future customers a reason to come back. Engagement does not end with a conversion or purchase. Leverage the planning power of Lucidchart to expand and grow your content marketing funnel.